Click for the complete article (PDF)! Wounds of living persons are a potential target for the same flies that live, or feed early on corpses. This can lead to complications in estimation of PMI but also allows to determine additional information that might be valuable in a trial, or during the investigations [e.g., M. Benecke, R. Lessig, Child neglect and forensic entomology, Forensic Sci. Int. 120 (2001) 155-159]. 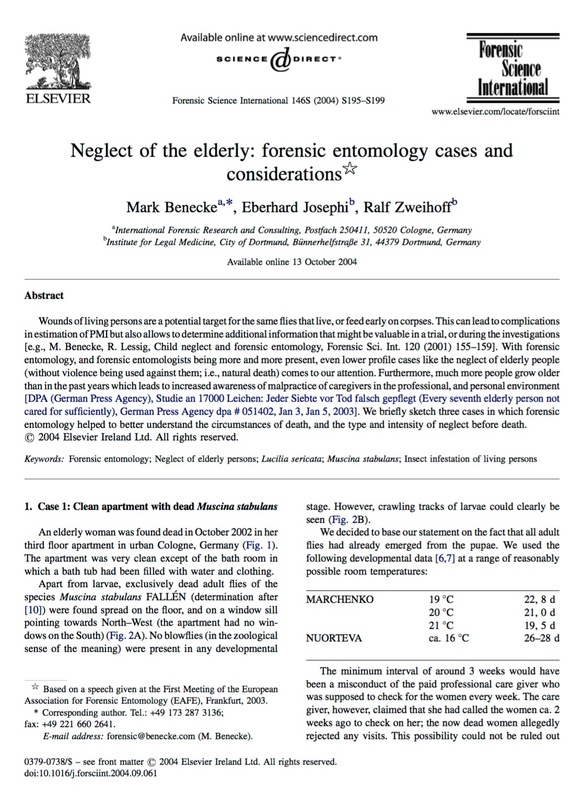 With forensic entomology, and forensic entomologists being more and more present, even lower profile cases like the neglect of elderly people (without violence being used against them; i.e., natural death) comes to our attention. Furthermore, much more people grow older than in the past years which leads to increased awareness of malpractice of caregivers in the professional, and personal environment [DPA (German Press Agency), Studie an 17000 Leichen: Jeder Siebte vor Tod falsch gepflegt (Every seventh elderly person not cared for sufficiently), German Press Agency dpa # 051402, Jan 3, Jan 5, 2003] . We briefly sketch three cases in which forensic entomology helped to better understand the circumstances of death, and the type and intensity of neglect before death. "A Fly for the Prosecution by Lee Goff"
This page was last modified on 4 March 2019, at 11:06.